You know that feeling you get when a beloved series ends and you can’t quite believe the story is over? That the literary hang-over I am feeling this morning after finishing a read-aloud of Wildwood Imperium (the third book in the Wildwood Chronicles) with my son yesterday. Sure, author Colin Meloy left a few hints that another book might be possible (as any good author would do) but for the most part, the loose ends of this engaging story about the Impassable Wilderness on the outskirts of Portland, where all sorts of strange magic happens and the most unlikely of children becomes the bravest heroes of all. Oh, Wildwood, we will miss you. Wildwood Imperium is the third book in the series and is not for the feint of heart. It has multiple storylines, and a rich vocabulary, and a style all of its own, with engaging characters and a treacherous villain (whose actions will surprise you), and the threads that come together to tie up the story are heartfelt and resonate with a respect for the environmental world and the unseen stories in our lives. If the Wildwood Chronicles does not become a movie some day, it would be a shame. Unless the movie sucked, then it would be a shame. But my son and I both agree that the series, if done right, could be a powerful storytelling experience. Meanwhile, I have two students who eagerly read the first two books this fall and who are waiting, hoping, that I will lend them this third one. Of course, I will. Of course. Today is the last day of daily Slice of Life writing as part of the March Challenge (but anyone can continue to write about the small moments on a regular Tuesday basis via Two Writing Teachers throughout the year). 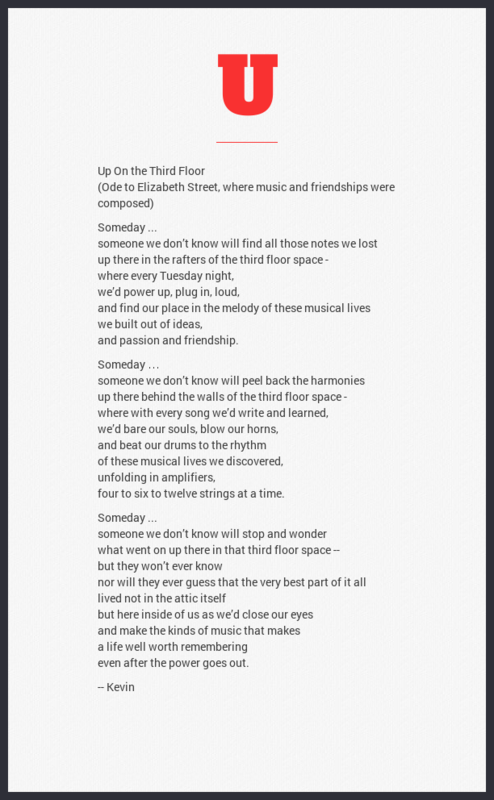 Each year, on this final day, I often reflect on the power of writing communities, and the connections made throughout the challenge. I notice the way that writing about moments in our lives opens up larger observations of the world in general. I pay attention to how writing remains the heart and soul of reflection. All that still remains true, and I’ll add that the growth of the Slice of Life community is breathtaking to watch unfold, as each year, dozens more teachers spend their days writing, reflecting, sharing, connecting, and it is a joy to see happening. Yesterday, though, I thought I might take a closer look at some of the writing and sharing that was going on during typical days of Slice of Life, gathering together some data. First of all, a disclaimer: this is so not-scientific. But I will explain how I went about it so you can take my numbers for what they are — a slice of observation only. For the average number of posts per day, I randomly chose five different days throughout the month and counted the Slicers who posted, and then averaged it out. For the gender gap, I chose three different days and did the best I could to determine gender, and then tallied and averaged those numbers out. For the number of comments, I took one single day and went to 10 different blogs, and tallied and averaged the number of comments at each blog. And for the topics, I created a chart and used one single day to put topics in different categories, mostly based on titles of the posts, which is far from perfect. And now, the Slice of Data, which I put into Haiku Deck to share out (and can’t figure out who some of the bottom section of letters are cut off … sorry). For me, the most striking slide is the Gender Gap slide, which is something we have noticed in the past with Slice of Life but this year, it became very evident as the numbers increased, the number of male writers did not trend with the women writers. This is not a bad thing, per se, just an observation as one of the few male writers. The iAnthology is a Ning site for NWP-affiliated teachers, so we have opened up the homepage but everything else under the hood — all of the participants’ writing and commenting and sharing — is not viewable by the general public. We even made a promise to our participants at the start — this space would be a closed community. Many early participants expressed gratitude that this would be the case, and some noted that they would not have joined otherwise. It was a sign of the times. In fact, I remember setting up a blog for our Western Massachusetts Writing Project Summer Institute one summer, and somehow, a few of the photos from the private site got archived by Google search (some tech glitch that I never quite figured out), and a teacher whose headshot could now be found on Google was irate and angry, demanding that we call Google and demand that her headshot get removed from any search queries. I was patient with her, and did some research and filed a request, but even then, I knew she was in a hopeless battle against the flow of information. I did feel guilty as the tech person who set up a site that allowed this to happen, though. We had promised privacy and the public had creeped in. It felt like a betrayal of sorts, even though I thought the reaction did not quite merit the offense, but there could have been some underlying story about protecting her identity that I did not know about. But times have changed, haven’t they? The anxiety among us is not what it used to be. People share everywhere now — on Facebook, on Twitter, with Instagram and Flickr, with YouTube. We’ve since added a Twitter connection to our iAnthology site, and there is a companion Facebook page. We’ve had a group on Flickr, etc. The flow of connections continues to extend outward. Or take part in the Online Learning site, which fosters the idea of wide open spaces for self-directed inquiry. Open learning is everywhere, and changing the face of how we write, connect, share and construct networked communities. It’s become a fabric of our times. So, our conversations this past week among a few site leaders have revolved around the prospect of opening up more of the iAnthology to public viewing, perhaps, in hopes that we might get more participation. We are also noticing how the seamless connection between platforms (ie, I write here, and share there and there, so that invisible threads connect what I am doing in one space to another space, and you connect with me). It feels like Facebook’s dance with privacy, and its claim that open is always better, and that unsettles me. Of course, with Facebook, the “open is better” means “more inroads for advertisements and profits.” We make no money off our writing community, and in fact, the Western Massachusetts Writing Project has funded the Ning for the past few years as a way to support and nurture teachers-as-writers. And so, my impulse is to keep the site closed and private, although I suspect that if Bonnie and I were to build a writing community today, I would advocate for an open space with many nodes of entry and sharing in a heartbeat. Times have changed. Yet promises are important and trust in one’s word is one of the anchors of any writing community. So I think we will probably remain closed in the age of open. 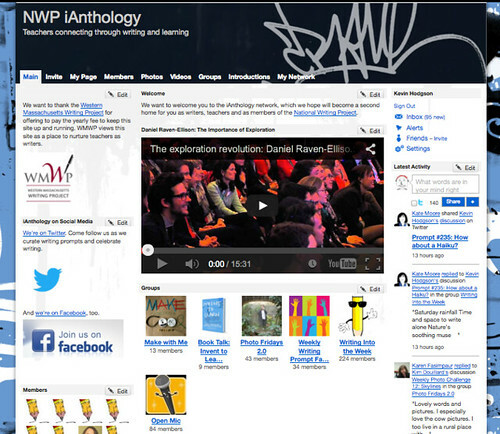 PS — Are you a NWP teacher or a teacher who has some connection to NWP? Come join us at the iAnthology. We have weekly writing prompts, a Photo Fridays feature, and a shifting variety of activities. Some events in history do unfold rapidly, and a new graphic novel imprint from Capstone Press seeks to use that as a the theme of a series of graphic novels under the banner of “24 Hour History.” It’s an effective structure for a book like D-Day, where so much happened in such a short amount of time, but which impacted the way World War II played out. 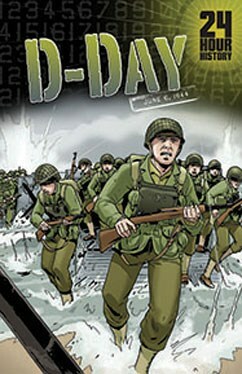 This graphic historical narrative, D-Day, is suited for middle and high school readers (although, interestingly, the Capstone site suggests an elementary grade level – I don’t agree, given the vocabulary and content here). Less a novel than a history lesson, the book begins with an introduction to World War II and then quickly moves into the planning and launching of Allied Forces into France as a move to turn the tide of the war and push Germany back through deception and overwhelming force. The artwork is nothing to write home about here (ie. rather bland and boring), but with the use of maps, timelines and geographic narrative devices (telling the story of each landing point) along with a few personal stories (which could have been stretched out a bit more, I think), D-Day is an effective piece of graphic non-fiction story that could easily be part of a classroom World War II collection. The writer even gives us some perspectives from both sides of the confrontation, although it is clear the Allies are the heroes here. The stories do not mince words about mistakes that were made and sacrifices given by soldiers in the name of war and liberation. The use of the 24 hour time frame allows the narrative to move at a rapid pace, as the reader shifts from landing point to landing point, with a clock face read-out on the corner of the frames. It is also helpful that the back of the book has short biographies of some of the main leaders on both sides of the battle, as well as a handy list of additional resources about World War II. My son has taken to leaving sticky notes in strange places, particularly when my wife or I are working or need some quiet time. I opened up my laptop yesterday and found this note, which had me laughing. 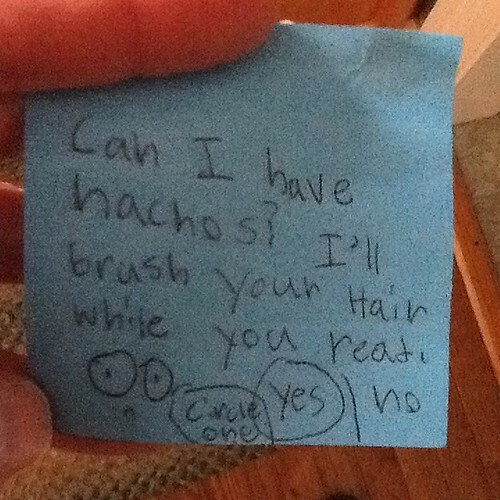 Notice how my wife circled “yes” to the request for trading a hair brushing for nachos. 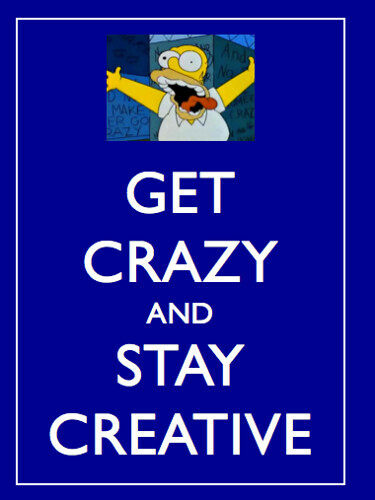 There is the very famous “stay calm” poster that you see variations of just about everywhere. Yesterday’s Daily Create via DS106 was to remix that poster’s saying. I went into Mozilla’s Webmaker tool and did my own version. What’s cool about Webmaker is that you can remix my project or you can go to the one that I remixed, and do your own. At the very least, check out the hilarious collection of remixed posters. In my push to experience a variety of open education programs (MOOCs and such), I signed up for the Learning Connected Learning 2 through the MIT Media Lab’s Lifelong Kindergarten project (and via the Educator Innovator network). I’m feeling a bit lost with it, though, and I can’t tell if it my own fault (I haven’t been paying attention?) or the way the course is set up (it isn’t drawing me in as it should?). I’m paying attention to this feeling of not quite being “there” because this coming summer, as with last summer, I am going to help to lead the Making Learning Connected MOOC for teachers (I hope you come, too!) We had a blast last summer — playing, making, connecting, reflecting — and we hope to replicate the experience and expand it this summer, too. Without pointing fingers at the LCL2 folks, who no doubt have worked hard to create a space for exploration, something seems to be lacking for me. I don’t feel connected into the experience. But it might be me, and I might need to buckle down and dive deeper in. So, yesterday morning, I tried one of the activities: introduce yourself via Scratch. If you don’t know what Scratch is, it’s a programming tools out of MIT that allows you to do simple coding and animation. I’ve never been a huge fan of Scratch — when I have used it with students, they lose interest quickly — but I like the concept of visual programming, and you can see the influence of Scratch’s innovative ideas in many apps and programs that teach students how to program and code. Apparently, though, thousands of kids are regularly using it, and the Scratch Community is huge and very active. So, it might be the way I taught Scratch, and not the platform itself. (There’s a theme of doubt coursing this post, I realize). Slice of Life: Oh … Behave! After spending a day with antsy 12 years olds whose outdoor activity during the day has been curtailed by a lingering winter cold front and who spent almost three hours, silent and mostly focused, while working on their state reading assessment, I was happy to see the buses roll out of the lot and head home yesterday. First, I had to pick up my son from his after-school band rehearsal — he is a rather reluctant percussionist — and I pulled into the loop a few minutes early, thinking I would read a magazine in the quiet of the van. But outside my window, something else ensued as two mothers almost went to fisticuffs over something … so … stupid. A few cars are in the loop. More are coming. There is car on the other side of the loop from me, parked just fine, when another car pulls up in front of it, and then reverses to get a little closer, in order to make room for other cars in front of it. I think nothing of it. We all do that — make room for others. I look over now. Lady Q’s car is fine. There’s plenty of room for Lady Z to pull out. I go back to my magazine until I hear Lady Q get out of her car. Uh oh, I think. Now I’m watching, wondering if I am going to have to jump out of the van in a minute and break it up. Really, all I want is a few minutes of quiet and my magazine. I can see Lady Q fuming. “Move your car,” Lady Z says and heads back into her car. Lady Q goes into her car, and starts up the engine. Instead of pulling forward, though, she slowly, slowly, slowly inches backwards until her bumper is a mere half-inch from the bumper of Lady Z’s car. There’s no getting out now. Lady Q shuts down the engine, jumps out of her car and raps on Lady Z’s window. As she rounds the driver’s side of the car in her wagon circling, Lady Q glares at Lady Z, who does not leave her car. Now, I wonder, what will happen if Lady Z’s child comes out from band and they need to leave? Luckily, Lady Q’s child emerges from the school first, and they take off, leaving plenty of space for Lady Q to get the hell out of there without another word. It was like being in the classroom, watching immature sixth graders fight over the space between their desks, and all I want to say is: Really? This is how you spend your energy? Behave.